Overwatch’s angelic healer Mercy got a massive makeover this month. The changes have turned her into the most popular hero across all levels of competitive play, according to data from hundreds of thousands of Overwatch player profiles collected by the fan-run site Omnic Meta. The stats show that Mercy currently gets selected almost 100% of the time across all levels from Bronze to Grandmaster. Omnic Meta notes that this is the first time they’ve seen an Overwatch hero get so popular across every tier of play. Blizzard told Compete that they “are unable to comment on data/stats on Heroes,” so it’s uncertain just how popular Mercy is, but she sure does seem to be popping up on every team lately. Mercy’s massive rework comes courtesy of patch 1.5, which dropped on September 19 and made big changes to her resurrection ability. Mercy’s popularity has led to a drop in the usage of other healer characters. According to Omnic Meta’s data, Ana’s pick rate has dropped the most, with only 20% of surveyed players opting for her nowadays. Other healers like Lucio and Zenyatta hover around the 30% mark. Symmetra is the least popular support character, particularly for Grandmaster players, who only choose her 5% of the time. The higher the tier, the more likely it is that Mercy will be selected. For Bronze players, Mercy has the lowest pick rate, but it’s still 87%. For Master and Grandmaster players, Mercy has skyrocketed to nearly 100% likelihood on all teams. Again, this means that Ana’s popularity in the high tiers has waned, which is surprising given how essential she used to be. Last season in Overwatch, many teams took advantage of the “dive” meta with three tanks and an Ana in the mix. Every team needs a healer, and now, it’s almost mandatory that the designated healer choose Mercy. Her newly patched Ultimate ability gives her speed, longer reach on her healing and damage beams, and the power of flight, so she’s strong enough now to stay close to the thick of battle. Before this patch, Mercy had to hang back and avoid the heat, but now, her resurrection ability can only heal one character at a time, and those characters have to be within a 5 meter radius. This all requires Mercy to stay in the action. It’s possible further changes will decrease her omnipresence in competitive play, but for now, her super-powered build makes her a must-have. 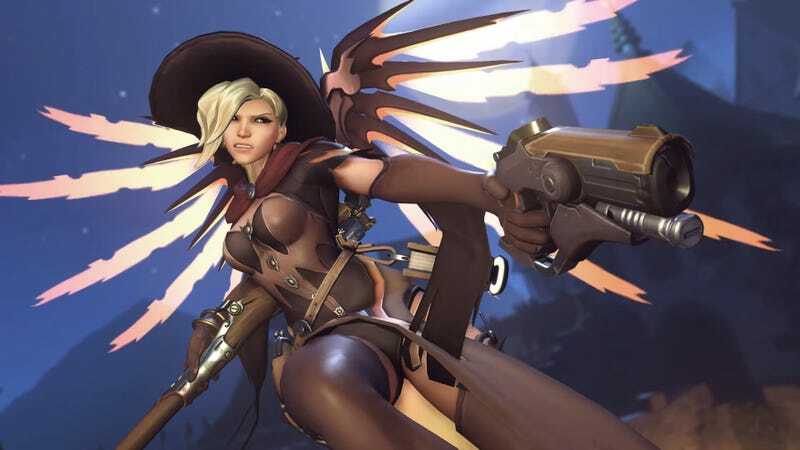 That’s great news for fans of the “Battle Mercy” style of play, but it’s too bad for any Overwatch healer who doesn’t like Mercy or her new battle-friendly makeover.